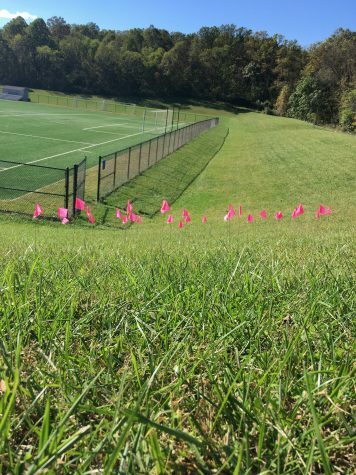 The Rams soccer team gave up an early lead to Urbana University, losing 2-1 on Breast Cancer Awareness Day on Sunday, Oct. 15, in Shepherdstown. Head Coach Jonathan Thayil and his team wore blue shirts with pink writing, on the front. 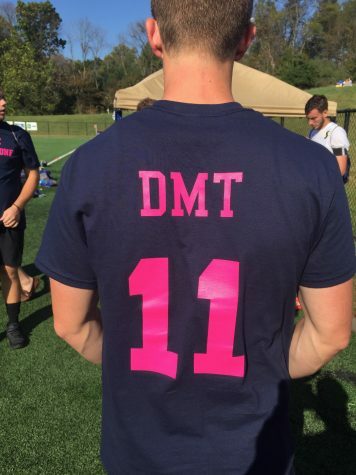 The shirts said,” No One Fights Alone,” and on the back, it said “DMT” with the number 11. DMT stands for Thayil’s wife, Dominique Thayil, who died in August of breast cancer. 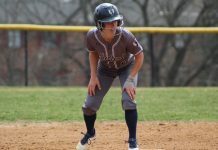 The number 11 represents the number she wore at Hood College. The team also honored breast cancer survivors by writing the name of a survivor or someone who died from breast cancer on a pink flag. Men’s soccer assistant coach Dylan Forshay wearing the shirt honoring Dominique Thayil. The Rams started the game with great energy and effort to get to the ball, communicating well, and displaying good ball movement. 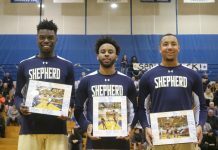 Shepherd started their offensive attack early on, as they had three corner kicks in the first 10 minutes. The Rams looked for their freshman forward Katherine Eddy several times, as she took a total of three shots on goal in the first half. The Rams were in an offensive formation the whole game, allowing their midfielders to join the attack. However, they were not able to score in the first half. Just two minutes into the second half, senior defender/midfielder Danielle Fernandez passed the ball off to sophomore defender Elishia Davis, who would fire deep from 35 yards out, dropping the ball into the back of the net. It was an impressive goal. 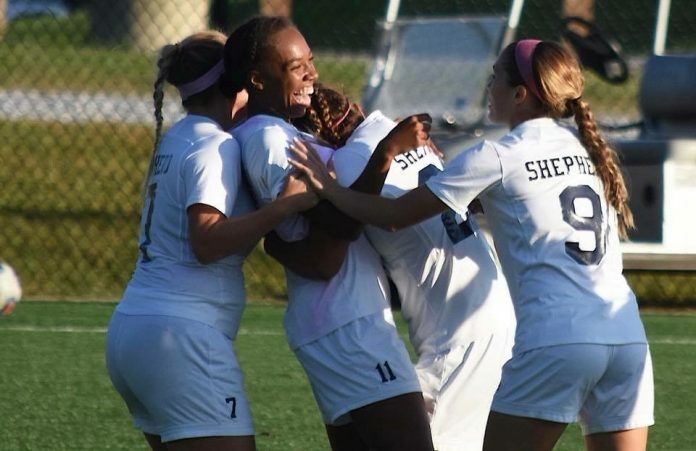 When her teammates realized she scored, they rushed over to celebrate with her. 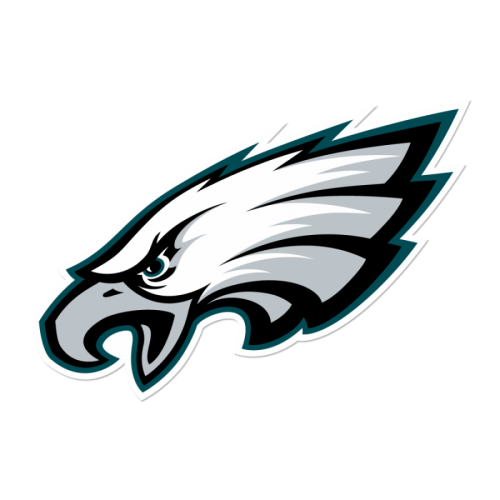 Davis had a strong performance, helping the Rams out on both offense and defense. After the score Shepherd would continue their offensive scheme, pushing the ball down the field to their left and right wings. Thayil started to make substitutions with 20 minutes left to play. 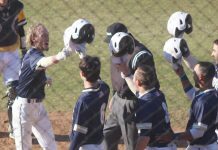 The Rams seemed to look complacent with just one goal as things started to open up for the Blue Knights offense. At the 81:58 mark Macy Torres of Urbana would kick the ball into the bottom left corner of the net, tying the game 1-1. After the score Shepherd looked to hurry and score another goal before time expired. They played anxious and made small mistakes with bad passes. With the game coming to an end, at the 87:02 mark, Urbana’s Kobe Bryant scored, securing the 2-1 victory for the Blue Knights. Next articleStudents Sally McKee (left) and Marley McLaughlin relaxing in the fall weather with their puppy on Potomac lawn.